Cumin cookies recipe / eggless cumin cookies – Jeera flavored biscuits without eggs. Its so buttery and melt in mouth cookie recipe. Bake the cookies for 15 to 20 minutes if you want it to be chewy and soft. Bake for more time like 30 minutes to get crispy biscuits. You can dip them in tea (chai) and relish. Cumin in Tamil is Jeera and it has a lot of health benefits. So its good to add in snacks and baked goodies as much as we can. You can add a little salt as well to get the salty and sweet version. These jeera cookies have a long shelf to store and also to pack as a gift. 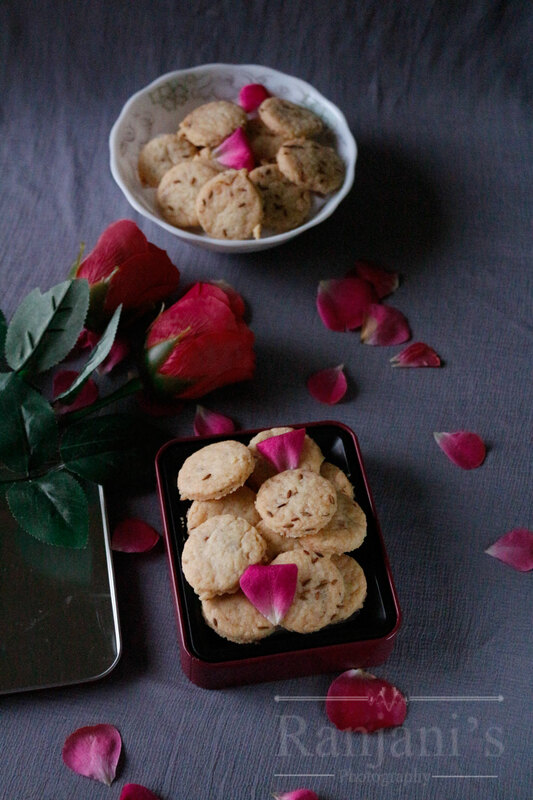 Its festive season so friends try this melt in mouth eggless cookies and gift your loved ones. Pre-heat oven to 180 degrees for 10 minutes. Crush jeera seeds using a rolling pin and keep aside. In a mixing bowl, add softened butter and sugar, beat well till it smoothens or sugar completely dissolves. Add all purpose flour or maida, jeera and knead to smooth dough. Put some flour on working area and flatten to thick roti using a rolling pin. Sprinkle some jeera on top and slightly press it. Shape it using cookie mold or any cap.do the same for remaining dough left after shaping. Roll them again and shape it. Arrange all the cookies on a baking tray. Bake for 20 to 30 minutes till the sides are slightly golden. Cool down completely and store.